Several weeks ago, I drove by a home in Apex that stood out among the others. This home, outlined in copper with stone walls and wooden shutters reminded me of something you would see in a graphic novel or “Lemony Snicket’s Trip to The Triangle” It was not a scary or haunted house, but it was obvious this was not the home of your average family either. 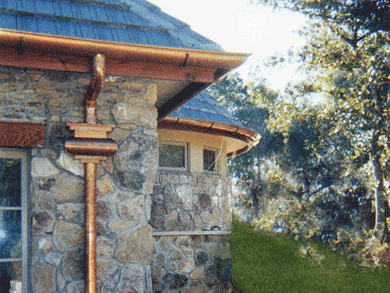 Since seeing it, I’ve noticed dozens of homes in the area employing the use of copper rather than your standard white aluminum gutters and it got me wondering what “look” they’re trying to achieve. For me, “Steampunk” jumps to mind. Steampunk is a genre of science fiction that has a historical setting and typically features steam-powered machinery rather than advanced technology. It is Victorian styled laptops powered by steam engines where copper is used in much of the design. A home, outlined in copper would certainly appeal to this small, but growing group of people, but are there enough “Steampunks” in Raleigh to have such an impact? What do you think? Share this post with your comments on Facebook and tag us @DanaBenRealty. Patrick Cox is the Creative Content Creator for Dana Ben Realty Group and is passionate over home design and gardening.